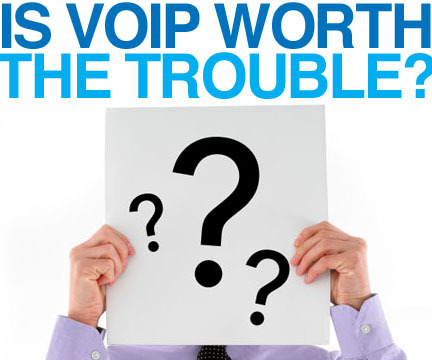 Is VOIP Worth the Trouble? During our current economical state, businesses are re evaluating what is worth spending money on. Phone service for a long time was just that, phone service however today with the help of VOIP, these same businesses are able to much more than in times past. VOIP these days has come a long ways away from the past where calls were dropped often and the inability to hear others clearly during a call have for the most part have disappeared with new advances in VOIP technology. Now along with consumer VOIP software like Skype being used on everything from laptops, phones and tablets, VOIP is becoming a household service these days. Choosing to get started with VOIP over tradition telecommunication is not going to be free or without its technical jargon and needs which we won’t go into, but over time the amount of time and money saved almost makes VOIP a must for almost any sized business.